With tech behemoths like Apple currently dominating the around $500 tablet PC segment that is all set to also play host to the likes of HP and others who are reported to be readying suitable devices to take on the Apple’s iPad, there seems to be another interesting battle shaping up in the budget tablet segment and one that too is getting hotter by the day. The latest to enter this segment is the zenPad tablet from the Hong Kong based start up company Enso Co. Ltd that has a sticker price of just $155 with another $25 for global shipping charges. This makes it one of the cheapest tablets in the 5 inch category. The zenPad is all about a backlit LED glossy resistive touchscreen that measures 5 inch diagonally and has a resolution of 800 x 480 pixels. Other technical aspects of the zenPad include an onboard 1GB flash memory and 8GB of storage which can be expanded further to 32GB via the microSD card slot. The 256MB of dedicated DDR RAM coupled with a 667MHz Samsung 6410 processor makes the zenPad quite zippy in its perfromance. The zenPad also has built in GPS and WiFi a/b/g/n functionality while there’s a 3G adapter too that you can opt for though it will set you back by another $35 and requires an USB port for plugging it into. The zenPad runs Google’s Android 1.6 operating system with no vendor locks so that the upgrade to Android 2.x is both a hassle free and simple exercise. Measuring 5.2 x 3.4 x 0.6 inches and weighing just 185 gms, the zenPad lives up to its tag of being a mobile and portable device. The device also includes a stylus for making onscreen inputs and can be stored neatly on the rear of the device in a special slot. Power comes from a 2000mAh battery that the company claims is good enough for 6 hours of run time which includes web browsing on Wi-Fi, video and audio playback. The zenPad will join the Archos 5 internet tablet that too sports a 5 inch touchscreen display and runs the Android OS though with a $250 starting price tag it loses out the price advantage to the zenPad that costs around a hundred bucks less. The Archos 5 used to be among the cheapest tablets in the 5 inch category until the emergence of the zenPad, which is reported to have a much better build quality than the Archos offering. The Archos 5 however scores over the zenPad with its far superior media playback capabilities and comes packed in with excellent audio and video software that enables the Archos 5 to support a wide range of media formats. While still on formats, the zenPad supports MP4, AVI, WMV, DIVX, Flash video formats and is able to playback MP3, WMA, AAC, OGG audio files. 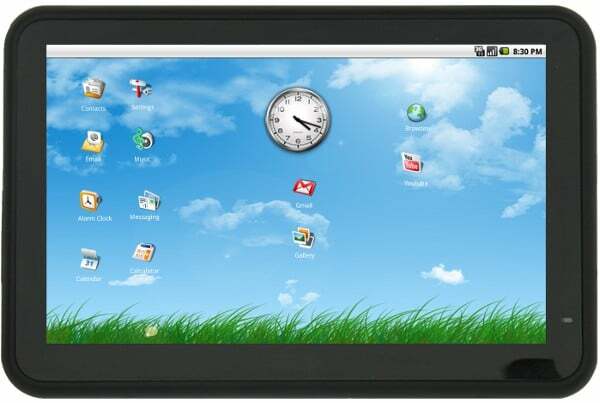 Further, makers Enso Co. has plans to enter the 7 and 10 inch e-ink based e-readers or tablet PCs with integrated 3G phone and running the Android OS. Keep watching our Good E-Reader Blog for more such Tablet or e-reader news. Also, make sure you subscribe to our monthly Good E-Reader Magazine if you wish to remain informed of all the latest happenings from the world of E-Readers and Tablet/Slates.